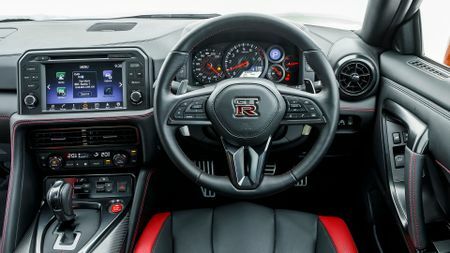 The latest version of the Nissan GT-R lists improved refinement, a plusher cabin and greater comfort among its upgrades. Does this mean the original enfant terrible has gone all gushy on us? The upstart Nissan GT-R has finally grown up. But don’t worry, it’s not quite ready for its pipe and slippers just yet. While it’s a more rounded performer in almost every respect now, as a consequence, it has lost some of the raw race quality that its legend was founded on. 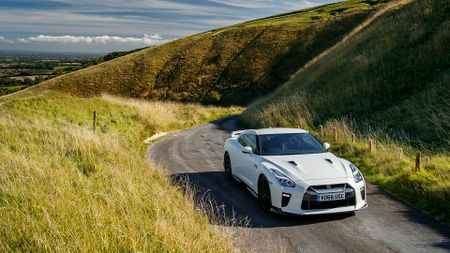 Toning down that edginess in favour of a more comfortable ride, enhanced refinement and significantly improved interior quality may not sit well with purists, but there’s no doubting the changes have transformed the GT-R into a more coherent everyday supercar. 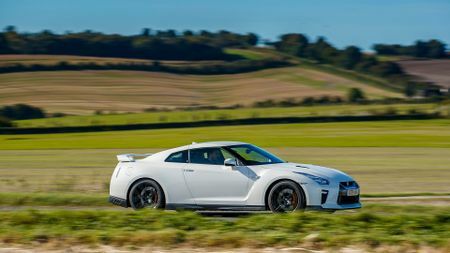 Make no mistake though, more cultured it may be, but the GT-R remains a hooligan at heart, retaining a level of blistering performance and handling that singles it out as a point-to-point weapon the equal of anything currently on sale in the UK today. Almost a decade after its launch, the Nissan GT-R is up for yet another annual upgrade. This time around however, the 2017 revamp goes much further than just adding more of the stuff that has left countless ashen-faced GT-R passengers in need of a change of underwear. Of course there’s more power. The piffling 542bhp the outgoing car had to struggle along on was nowhere near sufficient, so Nissan’s boffins have spun the turbos to even dizzier heights and summoned up another 20bhp, while ramping the torque curve up to an axle bending 470lb ft.
Trouble is, the additional pressure on the squeeze-bang-puff side of the equation means the furnace raging inside the 3.8-litre V6 gets mighty fiery indeed. To counter the increased hellfire, Nissan has chiseled out a frontal sinkhole-sized aperture to ram more cooling air under the GT-R’s bonnet. Job done? If only it were that simple. Bigger gaps mean increased drag and reduced performance, so while the powertrain engineers trotted off for a cheeky sake, the aerodynamicists got to work. Designing a stiffer bonnet to resist deformation at high speed, curving and lowering the front under-spoiler to improve airflow, and reshaping the side sills to counter lift, they successfully reinstated the GT-R low drag coefficient. Additionally, the rear pillars were strengthened and re-profiled to enhance streamlining. 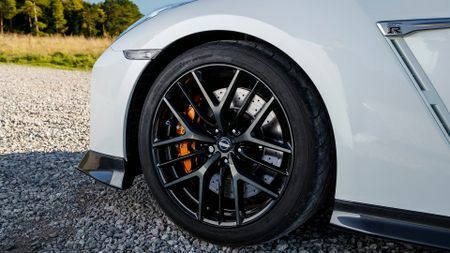 Nissan claims this stiffening also aids agility, and along with faster steering reactions, allows the GT-R to turn into bends quicker than ever. We’ll let your rib cage decide that one, but your eyes and ears will be better judges of the biggest changes to the 2017 GT-R. Inside, there’s a new dash and lashings of high-quality Nappa leather, plus a new BMW-style rotary dial behind the gear shifter to supplement control for the larger 8-inch infotainment touchscreen. Noise cancellation frequencies are now pumped through the front speakers to help reduce road- and wind-noise, which together with a new softer setting for the suspension means the Grand Touring aspect of the GT-R’s moniker finally has some semblance of credibility. 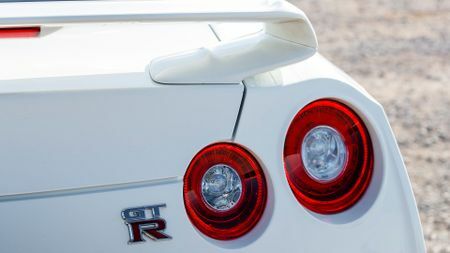 We could rabbit on forever about the GT-R’s myriad dash read-outs, trick four-wheel-drive system, switchable transmission calibrations, various suspension settings and improved aerodynamics, but what really makes Nissan’s seminal muscle car so truly epic is its hand-built twin-turbo V6 engine. 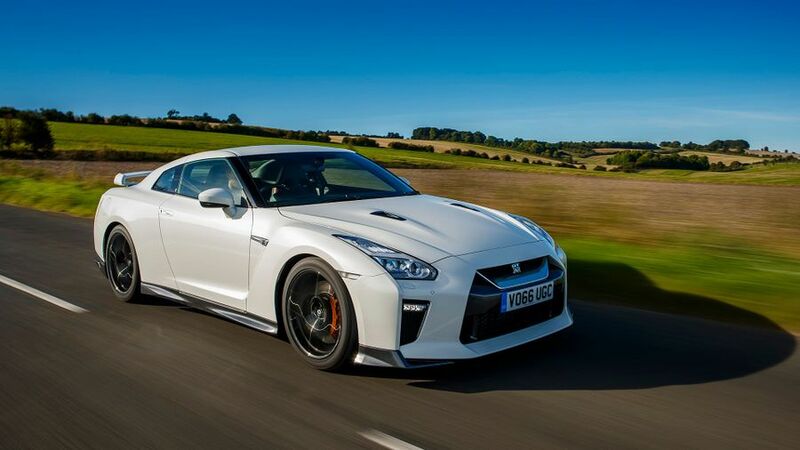 Nissan reckons it only has five master craftsmen building GT-R engines. Whatever they’re getting paid, it’s not enough. Now producing even more power and torque, there are few, if any engines that pile on revs with such effortless abandon, as the pistons challenge the implosion preventing 7000rpm red line. What’s perhaps even more mind boggling is the fact there’s only the merest hint of mechanical protest even when the engine is subjected to repeated full-bore upshifts. 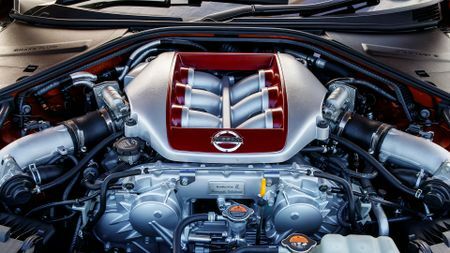 Fortunately, the GT-R’s sophisticated electronics and complex chassis arrangement are more than capable of handling the motor’s prodigious grunt. 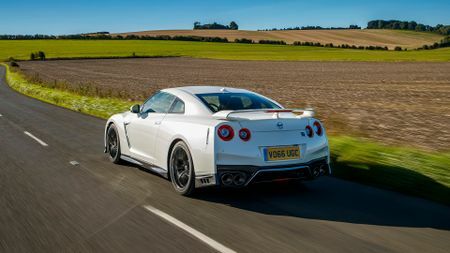 Leave the suspension setting in soft mode, bang the accelerator against the firewall, and the rear of the GT-R feels like it squats, before all four tyres dig deep into the earth’s crust and catapult the whole shebang towards the horizon at a truly bonkers rate. Considering the brutal performance, it comes as something of surprise that the GT-R’s steering is so delicate, but it’s also incredibly swift and deadly accurate. Although you can’t argue with physics, it feels like the GT-R would beg to differ. 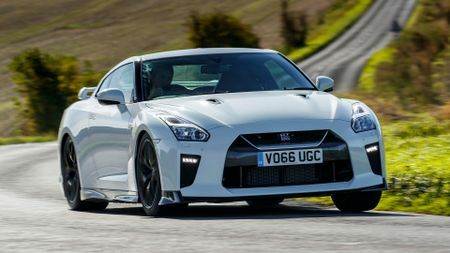 There’s no denying, at 1750kgs, the GT-R is no featherweight and it’s a pretty wide-bottomed fella too, but it rarely feels unwieldly or laboured, allowing you to place it on the road with millimeter precision. Even though the softest of the three damper modes is genuinely supple, it still permits speedy turn-in and an incredibly flat cornering attitude. It begs the question: What took Nissan so long to provide it, and will you ever need to select the firmer settings? The ability to drive with such impunity, at such insane rates, means the GT-R’s only real problem is its adrenalin induced addictiveness and the threat of a lengthy spell at her majesty’s pleasure. Well, that, and its confounded six-speed dual-clutch gearbox. State of the art not so very long ago, but in these days of super-smooth, unfeasibly flexible transmissions, the GT-R’s rear-axle-mounted shifter now seems rather antiquated. The shift paddles have at least been moved from the column to the steering wheel, making mid-corner shifts more intuitive, and the latest software upgrades have improved up-shift quality, but low-speed downshifts can still be heard and felt clanking away. On some occasions it can be so bad you’d swear one of the engine craftsmen had left his dentures in the works. Unlike the PDK gearbox found in a Porsche 911, the GT-R has no rev-reducing overdrive top gear. Consequently, the engine is spinning pretty rapidly at motorway speeds and swilling down super unleaded at a similar rate. Inside, things are definitely more upmarket and civilised than what’s gone before, although much of the switchgear still feels a bit too clicky and lacks the smooth damping and positivity of those found in a Porsche. Still, your rear passengers won’t care a jot about that, as they’ll be travelling in relative luxury compared to the cell-like conditions in the back of a 911. 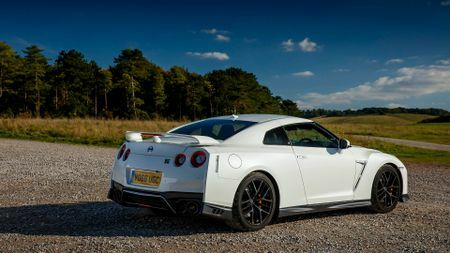 At £80-90K the GT-R can no longer be considered a blue collar supercar slayer, but even at this sort of money, it still offers a staggering amount of bangs for your bucks and owning one should certainly be on your bucket list. Will it cost an arm and a leg in fuel and tyres? Definitely. Will your dinner party guests raise a disapproving eyebrow when you let slip you own a GT-R and not a Porsche? Absolutely. Will you have to rein in your desire to exploit the GT-R’s addictive performance to the max? It’s near impossible. Will 911 drivers pull over when they see you looming in their rear view mirror? You betcha. The 911 remains the benchmark for rival sports car manufacturers and discerning customers alike. The latest cars are beautifully built, brilliant to drive, comfortable and super refined. 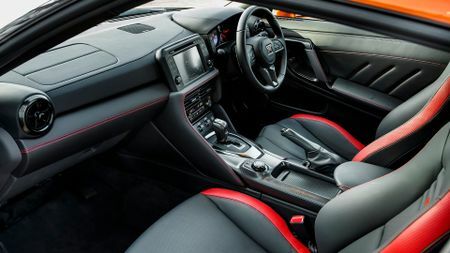 The R8’s interior is plush and packed with technology, and while it doesn't quite steer with the same scalpel-like precision as a 911, it sounds and feels a lot more dramatic. The AMG Coupe is a bit of a wolf in sheep’s clothing. Its swish looks and classy interior are similar to more mundane models, but the potent V8 delivers astonishing performance. Interested in buying a Nissan GT-R?